So, what's the holidays without FOOD? Yes, my friends- that is right- I am thinking about FOOD! My sister asked me last night what was on the lineup for dinner, so I thought I'd share what is on my shopping list for the Easter weekend. Over the years I've tried. My how I've tried. But as hard as I try, I just DON'T love to cook. I've bought cool cookbooks and taken classes. I even had a tv installed in my kitchen with the hope of some alluring program to entice me. But no. All efforts are futile. I just don't love it. I do it because I must. I have come to learn something about myself... I don't love food or the cooking aspect of food. I actually hate the chaos and the mess and I especially detest the sink full of dishes when all is said and done. What I do like is the artistic outlet it lends me. When I was young (before married days) I worked at a deli where I prepared different sorts of salads and fruit platters. I thoroughly enjoyed creating beautiful arrangements that were pleasing to the eye. Not sure about the taste because I never much cared. Easter dinner is no exception. We always buy the pre-cooked, honey glazed ham (not the real stuff with all the swirls of fat- EWW!). Heat and Serve. We buy our pie from Kathy's pies the day before. Everything else on the lineup is very simple and can be done ahead of time with little effort or time spent in the kitchen. I thought I'd share two of my favorite Easter recipes. The first one comes from the kitchen of my friend, Vicki Garbett. I snagged it almost 8 years ago now and make it only twice a year (because it truly is YUMMY- as in, you have to plan to burn some extra calories at the gym afterwards). It is only served at Easter and Christmas at our house. The other one was a find a few years ago and is light and perfect for a spring dessert. Plus it's lowfat and still delicious. Win win. Click here to find other recipe cards. Oh, and just so you know- I am totally buying the angel food cake already made. It cuts much better, takes less time, and tastes just as good. Why not? 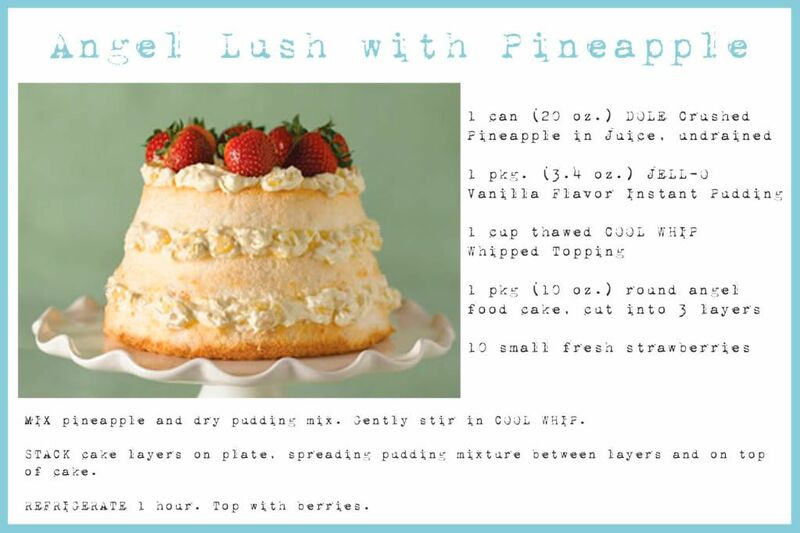 the angel lush pineapple recipe would be from your good friend LISA....i made that 3 years ago and you guys came over for easter, and it has become tradition in our house too.....love that cake.....very light and spring like! we do the same thing (almost).....ham, some veggie...rolls....yummy potatoes...and the cake! but we buy the fatty ham. where do you get that easy ham you guys do?? let me know where and the brand, it's good! hope you guys have a good easter, we are doing small this year with everything that's going on, just bought my candy for baskets today! by the way, i am not packing yet, just going thru rooms and cleaning and purging (have 2 stuff appointments). should be good though, jay will be going down there before us, and who knows when the house will sell. if it does sell within the next month, we want to let the kids finish out the school year then. so much unknown....very annoying!! thanks for the offer. where are you going next week? Going to NY for a girl's trip. oh my gosh....have fun!!! i can't wait to go to new york one day! So did my mom get here famous recipe from Vicki Garbett? I'm sure she did. 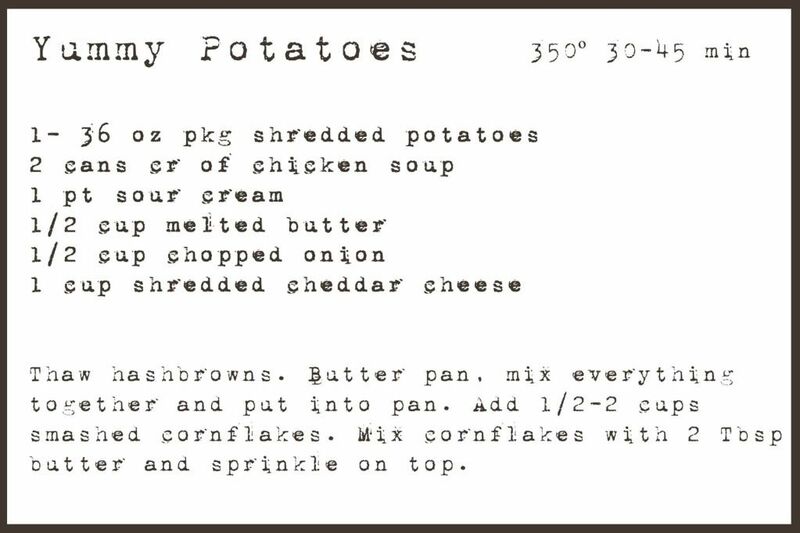 Ha-ha...Otherwise known as "funeral" potatoes in mormon world.